OmegaTurf has the most satisfied customers in the San Diego region. Read our Yelp reviews to get an idea of just how well received we are in the community. We count on having satisfied customers spread the word and we don’t spend a fortune on marketing—savings we can pass on to the customer. 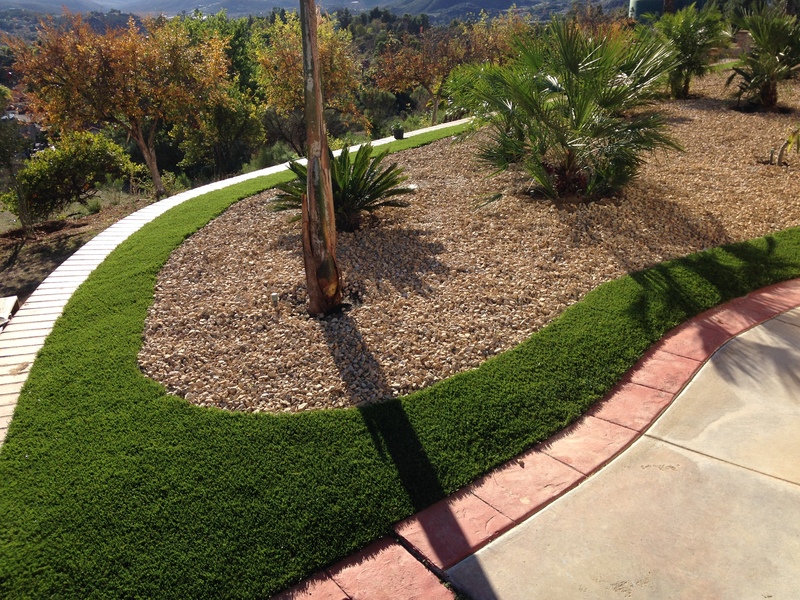 Synthetic Turf is Your Best Water Conservation Solution. Southern California is in the worst drought in history and is facing severe water restrictions. Maintaining a lush, green lawn is no longer an option. Artificial lawns require little to no water to maintain and keep clean. Outdoors watering accounts for up to 70% of typical usage. 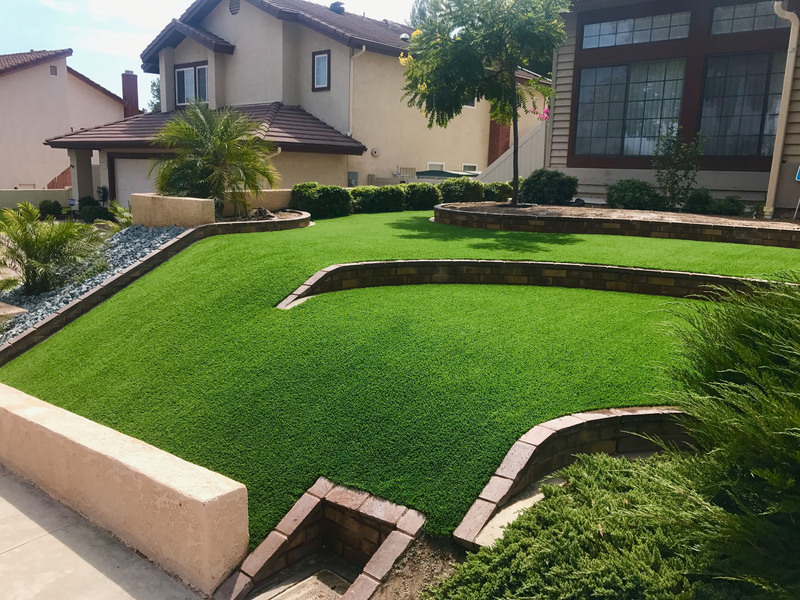 That makes synthetic grass landscaping a viable conservation solution, which allows you to meet the cutback requirements and save money on your water bill. Besides, you will have a beautiful lawn 365 days a year! Done correctly, a synthetic grass lawn will provide an attractive and useful space for your home for twenty years or more. Use our Contact Us page to tell us what we’re doing right or what we can improve on. This year we will be laying down another park over the pavement at KAABOO Del Mar. Come visit us at our Kiosk, kick your shoes off, stay awhile. Most people are amazed at how real our turf looks and feels like real grass (without the bugs and dirt). 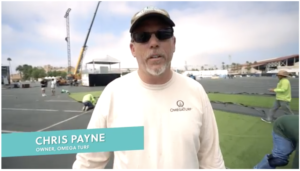 OmegaTurf has been a leader in the synthetic grass landscaping industry since 2006, installing the highest quality products, backed by our 100% satisfaction guarantee. We are fully-licensed, bonded and insured to protect you and your investment. The State of California has issued a mandate to cut back on water usage by a minimum of 25%. This water reduction MUST come from outdoor watering, as outdoor watering accounts for 50-70% of typical water use. We offer a variety of financing plans to fit your budget like our low interest, low payment and “12-Months Same as Cash” programs. We are also a HERO and Ygrene registered Contractor, with programs established to make your project more affordable. Check out HERO financing or ygreneworks.com for more information about these innovative programs. 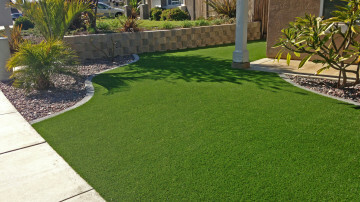 Hundreds of Southern California dog care facilities have made OmegaTurf their synthetic turf choice for their locations due to the comfort and practicality of artificial grass. 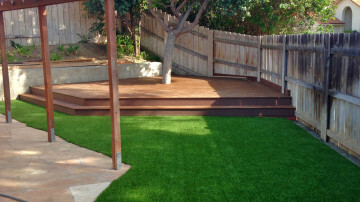 It is cleaner than real grass, drains great and provides an appealing space for their customer’s canines. WHAT SETS OMEGATURF APART FROM THE REST? 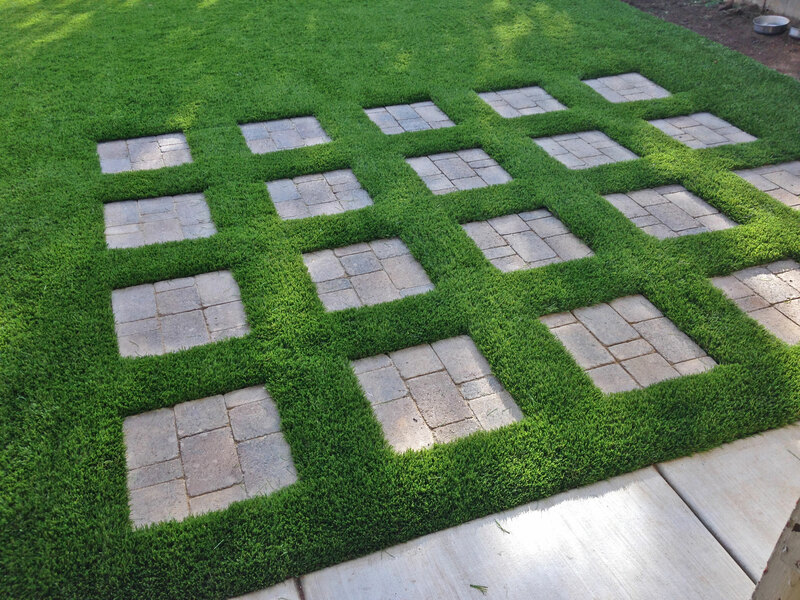 Unlike our competitors who just want to sell turf, we can help design all aspects of your yard make-over. Drainage is the most important place to start. All installers are employees that are trained, supervised, licensed, insured & bonded and receive company paid health insurance. OmegaTurf does not subcontract or employ day laborers. Most of our business comes from satisfied customer referrals and YELP reviews. Our motivation is to provide the highest quality products and superior customer service because our customers are our best sales people! Most of our competitors just want to install turf, we take on the whole project. Tree roots, branches, every patch of crab grass, rocks, debris, everything is cleared and prepped before we start installation. At OmegaTurf, we strive to be timely, diligent and finish the job as quickly and efficiently as possible. High Quality and Competitive Prices are what OmegaTurf is all about. 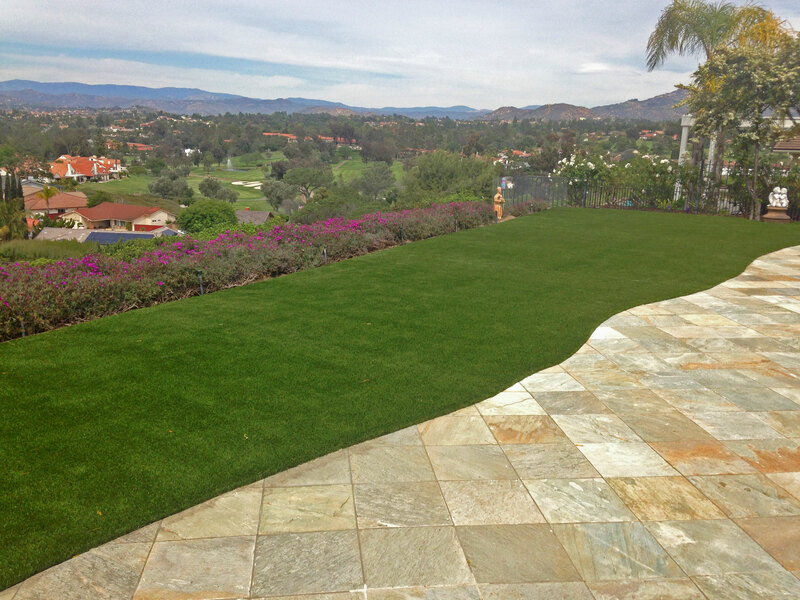 Unlike many other turf companies, we don’t cut corners with materials or labor. We provide a fair quote with no hidden fees or surprises. We have low overhead so there is no need for us to inflate our prices to cover expensive marketing and infrastructure costs. 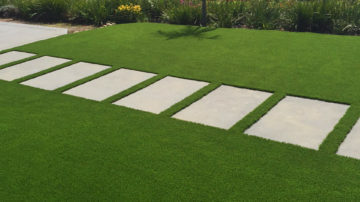 We run our business “Lean and Mean” to keep our prices low enough to fit the budget of most any customer considering synthetic turf and water conservation landscaping.